against the block’s brick and cement. long enough. You gotta trust the music. of the vegetable lady’s pickup. the apologies for the place of my birth. so beautiful that even I couldn’t bear it. before the grill of a fast moving car. and its memory absolutely nothing. in one of seven kinds of bewilderment. it looks like I’m always headed back. 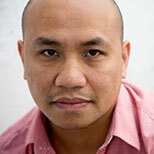 Patrick Rosal is the author of Boneshepherds, named a notable title by the National Book Critics Circle and the Academy of American Poets. His newest collection, Brooklyn Antediluvian, will be published in 2016. His essays and poetry have appeared in Tin House, American Poetry Review, Los Angeles Review of Books, Grantland, Best American Poetry, and many other journals and anthologies. He teaches in the MFA program at Rutgers-Camden.